Situated on 16km of white-beach coastline in Algoa Bay, Port Elizabeth is South Africa's fifth largest city and the largest in the Eastern Cape Province. It is also referred to as "PE", "The Friendly City", Madiba Bay, The Windy City", Die Baai (Afrikaans) and Ibhayi (isiXhosa). Port Elizabeth forms part of the Nelson Mandela Metropolitan Municipality. It's not to be confused with Port Elizabeth, the town on the island on Bequia! The economy of Port Elizabeth is to a large extent dependent on the motor industry, with the Ford Motor plant in PE, the FAW in Coega and VW in Uitenhage. Port Elizabeth has beautiful white-sand beaches with warmer water than Cape Town - King's Beach, Humewood Beach, Bluewater Bay, Pollock, Wells Estate Beach, Schoenmakerskop Beach & Shark Rock Pier/Hobie Beach. Historic attractions - the bell tower built in 1923 to commemorate the arrival of the 1820 settlers (at the entrance to the harbour), the city hall (completed in 1862), the old stone Fort Frederick (constructed in 1799 in case the French attacked), the PE museum (3rd oldest in South Africa), the South End Museum, Sakhume Museum & Xhosa Culture Centre, the Donkin Reserve and the Cannon from "The Sacremento". Township tours with Calabash Tours or Gugu's Township Tours, or just drive through the township of Kwanobuhle. Shopping at the Boardwalk, Walmer Park and Greenacres. Schoenmakerskop Beach (Schoenies to locals) is less busy than the more popular Port Elizabeth beaches, but locals especially enjoy going walking there, as it has some interesting rock formations. Port Elizabeth is situated in Algoa Bay on South Africa's east coast, about half-way between Cape Town and Durban. Port Elizabeth boasts a moderate subtropical climate all year round. Summers are warm with relatively low humidity, while winters are cool but mild. There is year-round rainfall. Click here to see Port Elizabeth's latest weather forecast. There are regular commercial flights to Port Elizabeth with British Airways, Kulula, SA Express, South African Airways and Mango Airlines. Port Elizabeth Airport is not an international airport, but has regular commercial flights to Cape Town, Johannesburg and Durban. There are no international flights from PE, but plenty of 1-stop flights (e.g. from PE to Harare via Johannesburg). Translux, Greyhound, Intercape and the Baz Bus connect Port Elizabeth to the major South African cities. Port Elizabeth can be reached by car via the N2 highway, running from Cape Town to Durban. The train station offers connections to Johannesburg and Cape Town. MSC offers occasional cruises to Port Elizabeth, as a stop between Durban & Cape Town. Spare a thought when cruising in, for the difficulties of yesteryear: "Algoa Bay must be paved with lost cargoes, everything from steel rails and other 'Glasgow jewellery' to slabs of marble and galvanised sheets". Hundreds of anchors have rested in the mud for centuries. Thousands of fathoms of valuable anchor chain have been abandoned there, enough to hold the fleets of the world. When bales and cases dropped from the slings the Customs men known as 'tide waiters' recovered some of the flotsam on North End beach; but Algoa Bay has swalled greedily fortunes in heavy freight that should have gone to the shore in lighters. Those who know only the modern all-weather harbour can have little idea of past hardships and disasters. Again and again the builders of walls and breakwaters were defeated by the violence of the sea & Port Elizabeth had to wait more than a century for the secure basin of today...As long as the wind blew from the west Algoa Bay offered safe anchor-age. When it veered to the east of Cape Recife a swell rose and the lighters became hard to manage...Black south-easters filled the sky with dark clouds and masters realised the danger before the gale warning was signalled from the shore. Tarpaulins were dragged over the holds of the lighters and all cargo work came to a halt. Small craft made for the shore. Ship after ship veered out more cable; sixty fathoms became seventy, eighty, a hundred, a hundred and twenty, and men wondered whether the great chains would stand the test. Steamers with their fires burning were safe enough for they could use their engines to relieve the strain or move out to sea if necessary. Sailing ships had to rely on anchors and chain and springs. Their crews stared across the anchor-age to see how others were faring and caught occasional glimpses through blinding spray. Landmarks became invisible. They heard the roaring of the gale, the surf on the beach, the nerve-racking creak and groaning of the windlass. All night there would be the lightning and the rain; the wind blowing at seventy, eighty miles an hour; men working frantically by the light of storm lanterns; rockets going up, tar barrels ablaze as signals of distress. Dawn would show the black cloud masses still racing overhead. Dawn on the beach would bring sorrow to all who set eyes on the doomed and the dead. Sometimes the crowds on the beach were able to count the men in the bows of a wrecked ship, but they had to watch them drowning, one by one." Laurie Green in Harbours of Memory. 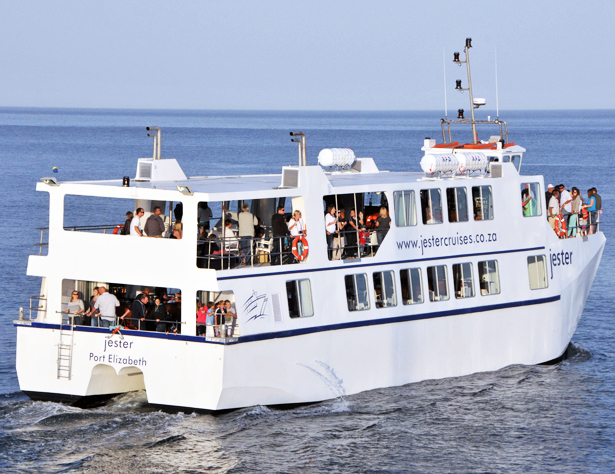 If you're not up for a big cruise from Cape Town to Durban, then try a Jester Boat Cruise in Algoa Bay. Humewood was initially known as the "Downs"; which was a spot where sand accummulated before seeping back into the ocean. Port Jacksons were planted by convicts as part of an attempt to reclaim then land, and refuse laid out with a resultant crop of tomatoes and other wild plants - eventually after years of work today's Humewood resort rose from the sand. Daggaboer Farm Stall (082-568-6174) 47km from Cradock on the Port Elizabeth road. Jacksonville (Florida) and Palm Desert (California) are sister cities to Port Elizabeth, whilst Gothenberg (Sweden) has a friendship relationship. 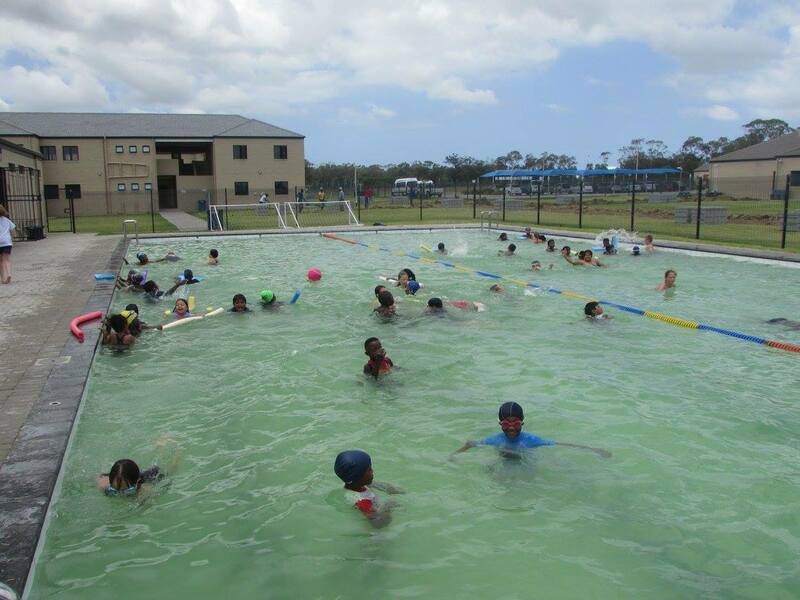 Are you looking to move to PE on a more permanent basis? You could possibly send you kids to the Curro school in Westbrook - click to see contact details. The dolphin lake is completed, and the pool is reestablished as a fish tank. The Oceanarium's 750,000 litre main fish tank is built (used to house dolphins up to 1968). A bell tower (Campinile) with 204 steps is completed near the entrance to the harbour, to commemorate the arrival of the 1820 settlers. 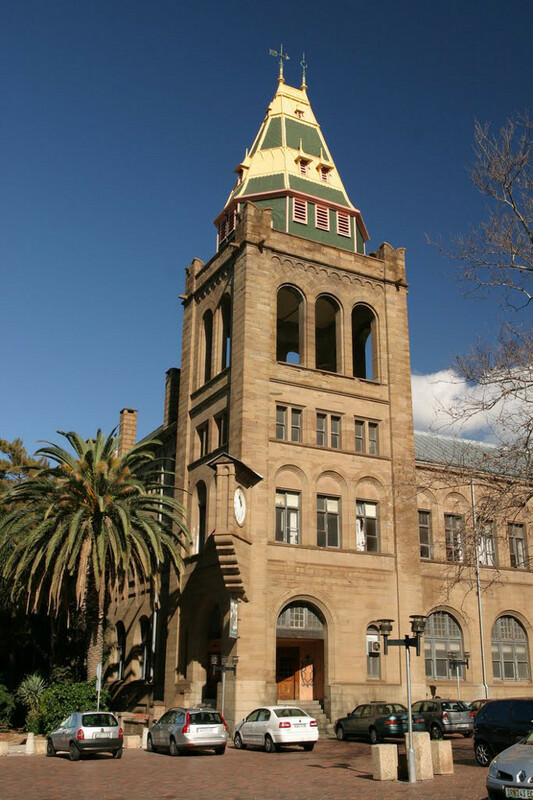 The tower contains the biggest carillon of bells in the country. A marble statue of Queen Elizabeth is unveiled. A lighthouse is built near the pyramid monument (which was built in honour of Elizabeth Donkin). The lighthouse today houses PE's Tourist Information Centre. The City Hall is completed. The Charlotte, a ship carrying 163 soldiers, 11 women and 26 children, from Cork to Calcultta, is wrecked in Algoa Bay. The city's public library is completed. Port Elizabeth is founded as a town to house British settlers as a way of strengthening the border region between the Cape Colony and the warlike Xhosa tribe. Sir Rufane Donkin names Port Elizabeth after his late wife, Elizabeth. Elizabeth had died in India 2 years earlier, and Donkin erected a pyramid in her honour above the centre of PE and proclaimed the surrounding open space a public area in perpetuity. The Cape falls into British hands, and they build a stone fort overlooking Port Elizabeth.